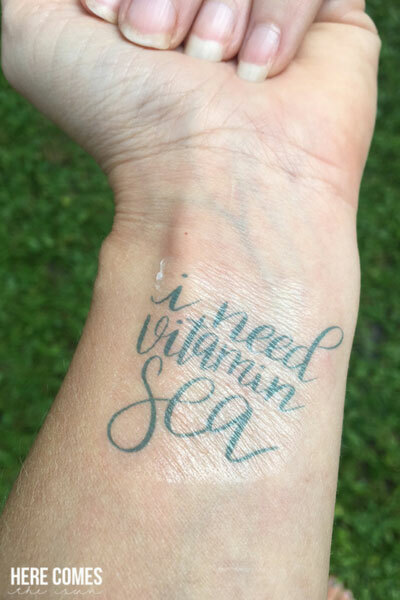 These hand lettered temporary tattoos are so fun and colorful! Make some for your next get together. It’s easier than you think! 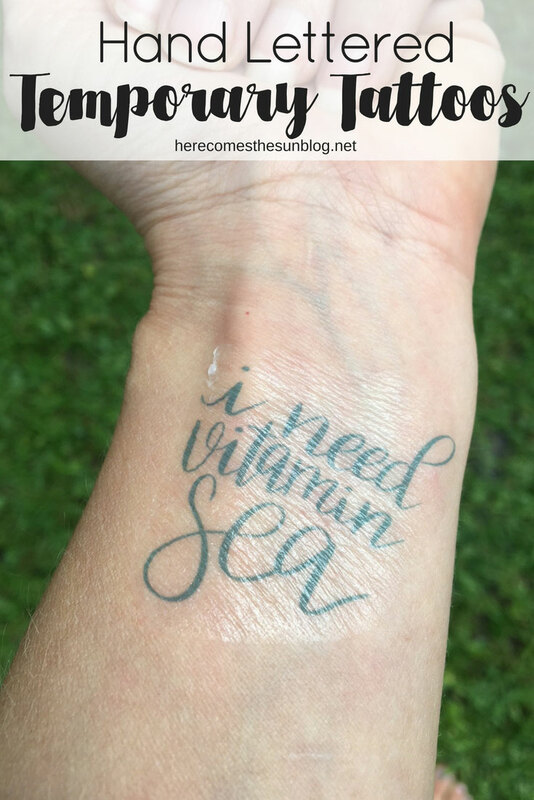 I’m always looking for new ways to incorporate my hand lettering into projects and today I’ve got a fun one for you: hand lettered temporary tattoos! I don’t know what it is about temporary tattoos but I think they are so much fun. There’s something magical about putting one on your skin, peeling the backing away and being left with a colorful design. Fun fact: did you know I have a real tattoo? Yep. My friends and I got them in grad school. We all went to the tattoo parlor together. Do you know why I decided to go? Because it was during finals and I was sick and tired of studying. I needed a study break and I came home from that break with a tattoo. I guess I though the pain of the tattoo would be less than the pain of finals. I’m not sure what I was thinking. Luckily these temporary tattoos are completely painless which makes them even more fun than real tattoos. In order to create your own temporary tattoos, you need to first download the free file. You can access them in the resource library, below. It is supposed to be backward so don’t freak out! Once you have it downloaded, print it out onto the glossy side of temporary tattoo paper. I used the Silhouette brand for this project. Next, follow the instructions on your tattoo paper. 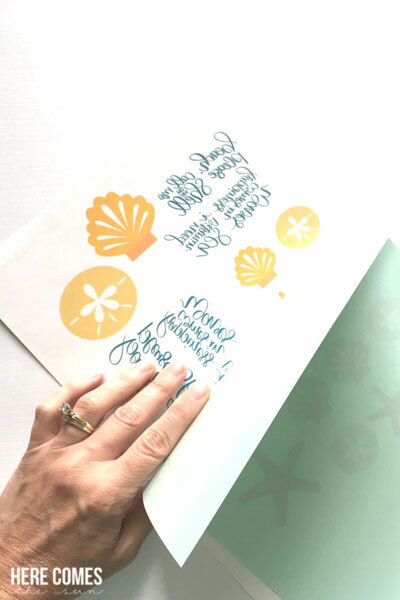 For the Silhouette brand, you place the adhesive sheet over the printed image and smooth out any bubbles. Next, cut around each tattoo that you want to use. Make sure to cut as close as possible to the shape and follow the outline. This is something that I didn’t do but if you notice on my final picture, you can see the tattoo adhesive on your skin. This is why you want to cut as close as possible to the design. Remove the clear backing and place the temporary tattoo on your skin. Place a wet washcloth over it for approximately 20 seconds. Make sure to get it nice and soaked so the tattoo transfers. Peel away the backing paper and you are left with a colorful temporary tattoo. 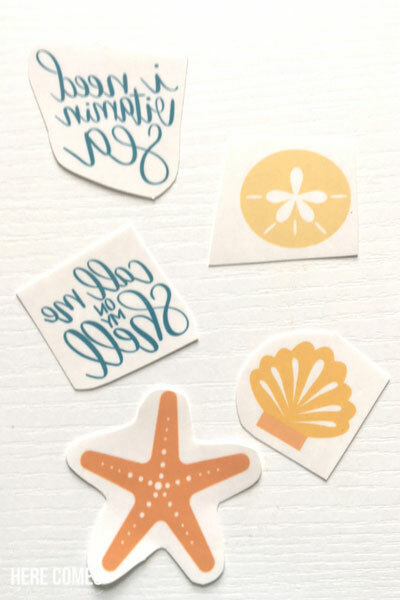 In addition to the hand lettered temporary tattoos, I also included some more beach themed tattoos that are from my sea life cut file set. 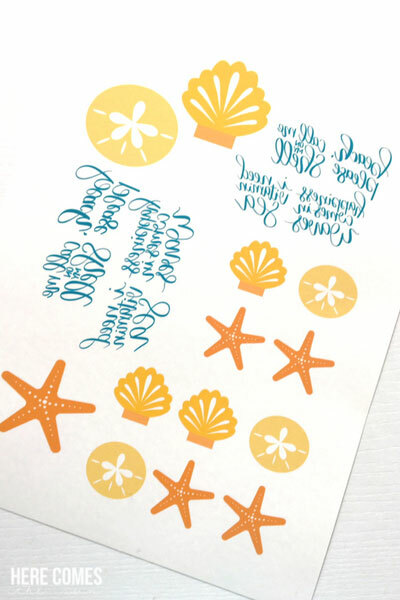 Use these hand lettered temporary tattoos for any occassion! A night out with the girls, a summer party or just because. My kids had so much fun with them! The summery sayings make them perfect for this time of the year.